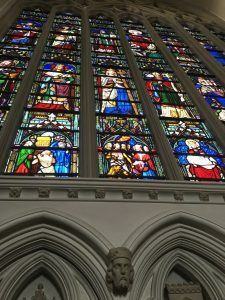 From medieval times, when the people were largely illiterate, artists have designed stained and painted glass windows, which are not only works of art but also visual story books. 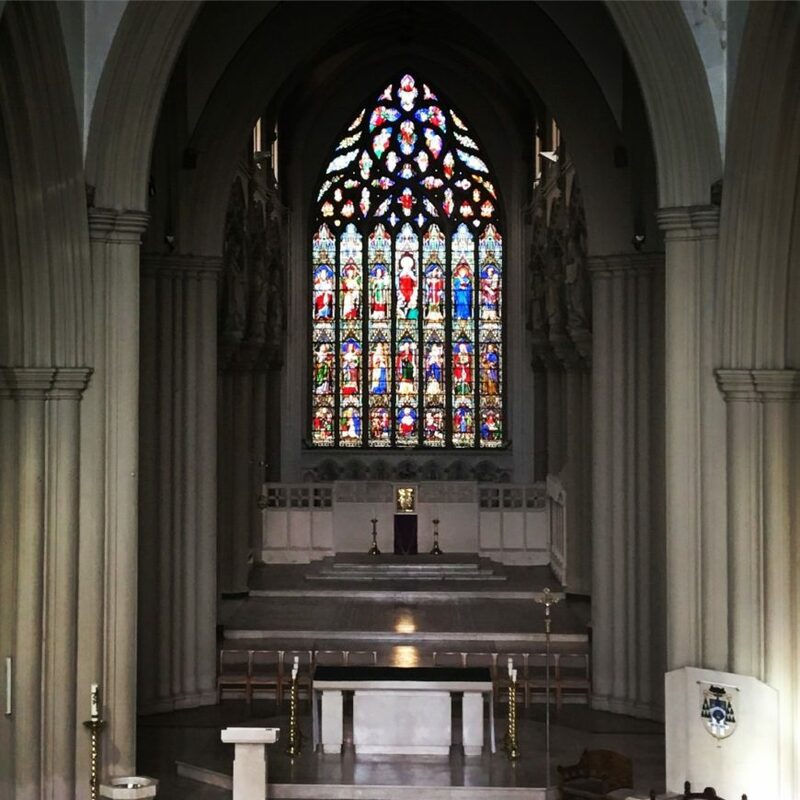 Our Cathedrals’ pride and joy, the great East window is such a history in glass. It recounts no less a story than that of the glory of the Catholic Church in England from the conversion of Ethelbert, King of Kent, by the first Archbishop of Canterbury, St Augustine in AD 597, up to the restoration of the Catholic hierarchy in 1850. 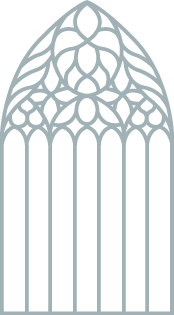 The work of William Wailes of Newcastle-upon-Tyne, the window is 40ft in height with seven lights (individual windows) beneath flamboyant tracery. Wailes’s use of rich bright colours make the window easy to study, even on the dullest day, bringing vivid life to the story he is telling. Look first at the tracery at the top of the window. Here, the artist is showing us the Communion of Saints – all the members of the Church: in Heaven, on Earth or in Purgatory, in union with each other in being one body in Jesus Christ. 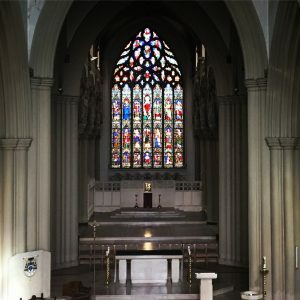 During the Second World War, the precious stained glass of this window was removed and carefully stored in the care of the Montfort Missionaries at Leagram Hall near Chipping, Lancashire. The window was restored to its present day glory between 1947 and 1949. In the very centre of the tracery, he shows a priest attended by servers, raising the Host at the Elevation. Around him are a cross section of the people on Earth, who share in the sacrifice of the Mass – men and women, boys and girls, a King and a Queen, a Bishop and a Priest. Beyond them the souls in Purgatory wait with raised hands for the release which will come to them from the Mass – among them are men and women, a King and a Queen, a Bishop and a Priest. Now we look to the centre light, where we see Our Lady, Help of Christians, at the top; then Pope St. Gregory the Great, the instrument chosen by God for the conversion of England and at the bottom, the Dowry of Mary – the island of England with two of its great Cathedrals, York and Lichfield. To the left of Our lady and St. Augustine of Canterbury in green vestments; St. Alban, the first layman martyred for the Faith in England; and St. Edward, King and Confessor. St. Margaret, Queen of Scotland best known for her care of the sick and the poor; and St. Helena, mother of the first Christian Emperor and finder of the True Cross (which she holds in her hand). It was the year of the solemn definition by Pope Pius IX, of Our Lady’s Immaculate Conception. To the right of Our Lady are: St. Thomas of Canterbury, slain in his cathedral defending the Church; The Venerable Bede, Saint and Scholar; and the Abbot, St.Benet Biscop. The introduction of Christianity to England with the Baptism of a future saint, Ethelbert, King of Kent, by St. Augustine in AD 597. King Richard I (The Lionheart) leaving the Bishops of Ely and Durham in charge of the country as he sets out on a crusade AD 1189. King Henry II acknowledges the authority of the Church by doing penance at the tomb of St.Thomas of Canterbury (Thomas A Beckett) AD 1174. Penal times, persecution and martyrdom. The restoration of the hierarchy in England by Pope Pius IX in 1850. England, The Dowry of Mary. King Henry VIII denying the authority of the Church in the presence of the Papal Legate, Campeggio. St. Ursula, a virgin martyr of royal blood; St. Winifred, martyred at Holywell; and St. Walburga, who went to help the Devonian St. Boniface in his mission to Germany.